You'll never believe what MDL4000 students are learning .... click to find out! How will you craft personal and social media spaces with intention? Frank Baker makes reference to the 5 P's approach, as outlined by David Considine, when teaching about advertising. By focusing student's attention to these factors, they can look deeply at advertised messages. 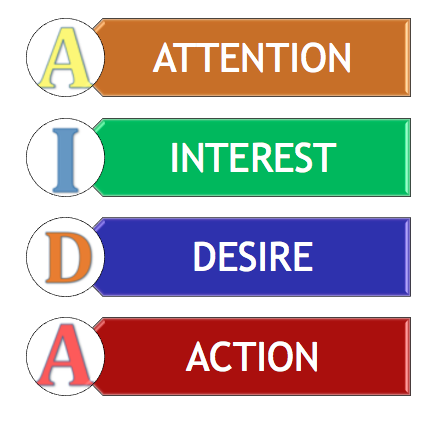 Frank Baker's text Media Literacy in the K-12 Classroom (2016) presents an advertising formula known as AIDA - Attention, Interest, Desire and Action (p. 107-108) that can be used in educating older students about advertising messages. This formula is used by copywriters to create media messages that will gain attention, hold interest, enhance desire for the product or service, and incite action from the audience. 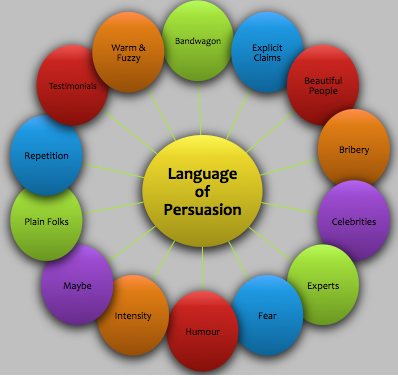 From the document titled The Language of Persuasion it becomes evident that advertising is focused on matching a product to an audience. Techniques used to persuade people are categorized as basic (easily recognized and identified), intermediate (techniques requiring a more critical stance) and advanced (techniques that require more abstraction and judgement). BASIC TECHNIQUES include association, bandwagon, beautiful people, bribery, celebrities, experts, explicit claims, fear, humour, intensity, maybe, plain folks, repetition, testimonials, and warm & fuzzy. INTERMEDIATE TECHNIQUES include the big lie, charisma, euphemism, extrapolation, flattery, glittering personalities, name calling, new, nostalgia, rhetorical questions, scientific evidence, simple solution, slippery slope, and symbols. ADVANCED TECHNIQUES include ad hominem, analogy, card stacking, cause vs. correlation, denial, diversion, group dynamics, majority belief, scapegoating, straw man, and timing. Extending your understanding of some of these advanced techniques can be done by viewing this series of videos from the PBS Idea Channel. These words, overused and vague are often attached to products to interest the audience to attend to the advertising message. As described in Frank Baker's book Media Literacy in the K-12 Classroom, these words apply to "anything and nothing" (pg. 76). 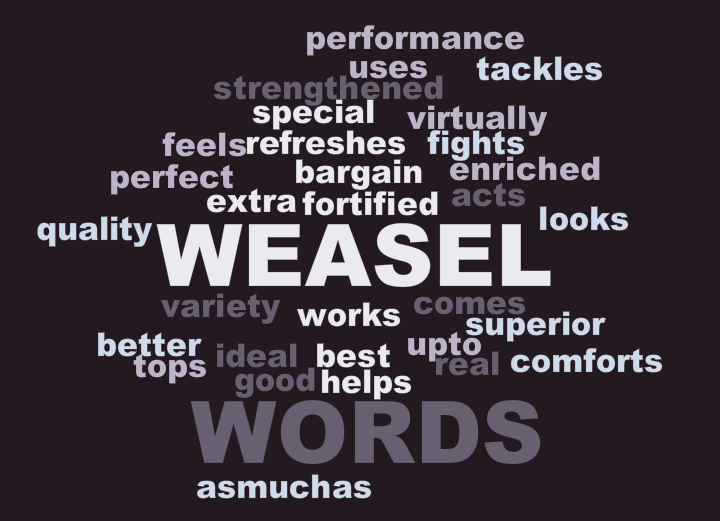 Keep an eye out for the use and overuse of these weasels as you explore advertising messages aimed at marketing to children. This technique is used online to create 'click bait'. One educator is using this strategy to enhance and communicate the course syllabus. When accessing and analyzing advertising in print, web or video formats, it is essential to think about the authorship, purpose, message, meaning, representation and reality. 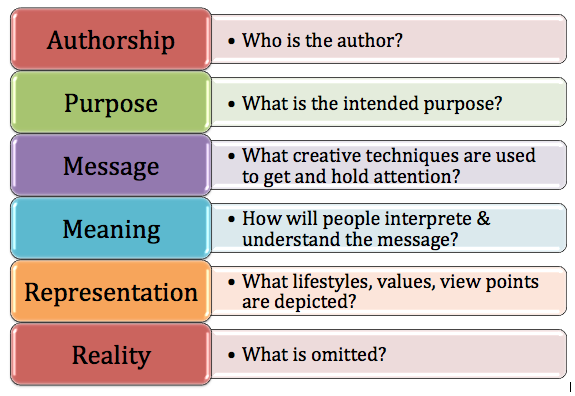 ​This model and key questions is adapted from Renee Hobbs' work in the book Digital & Media Literacy: Connecting Culture and Classroom (Corwin-A Sage Company. p. 57). Let's take some time to analyze an advertising campaign that uses a discussion of media-driven body image issues as it's method and purpose. Dove has changed the focus for their products by targeting media and advertising and attaching the Dove name to the campaign to heighten awareness of body image issues. ​Watch each of these short clips and analyze the message based on the 5 P's - product, purchaser, pitch, placement and presentation - and the key questions from R. Hobbs' work -authorship, purpose, message, meaning, representation, reality. Determine which techniques of persuasion are applied in each of these messages. Access the LOTUS CHART found on the right (adapted from the one found at http://edgalaxy.com/thinking-tools/2012/9/6/lotus-chart-thinking-tool.html) to begin your analysis of the media messages below. Consider how marketers view and target children. 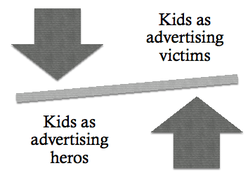 Consider the ideas presented - Kids as advertising heroes or victims? How do marketers target young 'consumers'. Review this Media Smarts Article to learn more. Review the Association of Canadian Advertisers codes and standards for advertising as they relate to using and targeting children. Consider how these will impact your work with children around marketing and awareness of advertising. 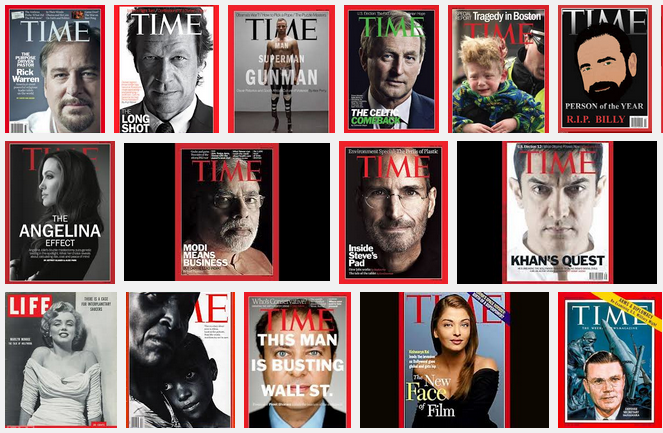 NOW consider how you perceive children in the media rich world around them - are they victims or heros? How will you teach children to be advertising heros rather than victims? Frank Baker describes magazine covers as advertising. Covers communicate to viewers using symbols and informational text. 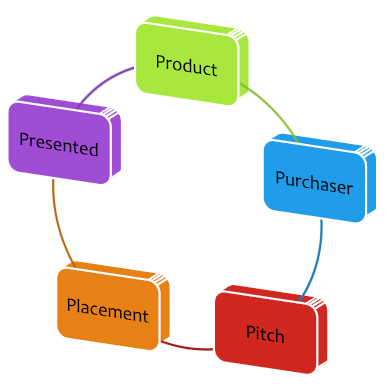 Gaining an understanding of terms and techniques used to construct advertisements is an essential media skill. When creating advertisements, including covers of magazines which advertise the product inside, graphic designers and editors communicate messages. These messages are implicit and explicit in the application of techniques within the layout, cover line, vanishing line, selling line, heading, sidebar and balance. 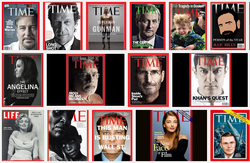 Deconstructing magazine covers and static ads (as found in magazines, billboards or newspapers) can provide students with an understanding of how the message is created. Review the information and cover designs found on this Media Studies website. Continue your investigation into the deconstruction of magazine images by reviewing the design information found here. NOW, create a magazine ad featuring YOU. This can be done as a 'real' magazine using a word processing and/or drawing tool. It can incorporate images that you captured last week during your 'take a picture' activity, or avatar images you have created as part of your introductory activity. You can apply design techniques to 'sell yourself' to an intended audience - your placement class, your friends, your family or your future employer. Use either BigHugeLabs site and download your finished project OR Fake-azine and screen capture your finished product. Remember to use the advertising phrases and techniques to 'sell' your self. 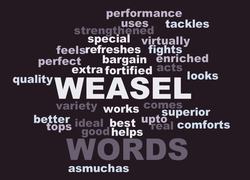 Use key words from your 'bio' to focus on your skills, attributes and interests. We'll take some time to explore in YouTube where you can sign up and create your own channel. From this channel you can create playlists that will support your teaching. This will organize video resources you wish to collect, curate and use for specific teaching topics. Learn how to use the VIDEO MANAGER to edit, set privacy, and share playlists. Connect to the MDL4000 video playlist to view resources curated for this course. Baker, F. (2016). Media Literacy in the K-12 Classroom. International Society for Technology in Education.